For those of you who are old enough to remember or have read the book, “1984” by George Orwell, the future is no longer in a far-away place, it is our present state. For those of you who haven’t read this book, I suggest you do so. Understanding when it was written makes watching its lessons unfold nothing less than fascinating. There is a lot of buzz in the industry about Artificial Intelligence (AI) and Machine Learning (ML) which should be expected, given our continued fascination with the next “shiny tech tool.” Look beyond the excitement and misplaced euphoria for a moment as this article in the Wall Street Journal has done and you will also see a fundamental issue which challenges the hope in AI/ML being the panacea to all business problems. The point of this article is that even the largest companies with the deepest pockets cannot gain tangible business value from simply purchasing tools, no matter how sophisticated they promise to be. The old adage, “Garbage In, Garbage Out” remains true, no matter how cool technology has become. The point is that companies will address these underlying issues because without doing so, taking advantage of sophisticated tools to drive the business forward is not possible. Having said that, we can agree that George Orwell was right about the future and that future is becoming our present at an increasingly rapid rate. Given that frequency and pace of change are both increasing in parallel, organizations of all sizes are struggling to keep pace but this is much harder for smaller organizations due to limited resources. Just like in the video game “Frogger”, executives and leaders are trying to find the right path for moving their business forward, while avoiding being run over by the constant threat of change. Working with smaller organizations, I’m realizing that they are not just competing with their peer groups but also with the world’s largest, most “digitized” companies to deliver an experience we all expect, as customers. What we hear from smaller organizations is that they want to create the best customer experience but simply do not have the resources (skills, infrastructure, tools) to do so. These organizations recognize that change is critical to their survival but they face a steep, difficult path ahead. How do these organizations deliver an experience similar to Amazon, Apple or any other successful “digital” company that their customers have come to expect without having access to the same level of resources? The most successful “digital” companies leverage modern business and tech frameworks (e.g. Agile, DevOps, DataOps, Cloud, Microservices etc.) to meet their customer needs before their competitors can - we call this “Time to Value.” Implementing and adopting such frameworks requires the most important resource of all - money! Building an infrastructure to support execution of these frameworks does not happen overnight. Besides investing in supporting technology, your organizational culture must promote the use of these frameworks as the “way we work” and include people with the right skill sets. But there is hope. 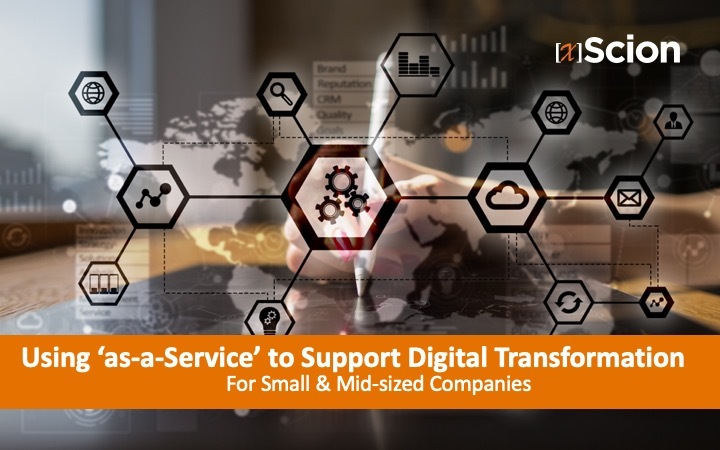 Mid- and small-sized organizations can leverage the same, sophisticated tools through “As A Service” models. Delivering applications and business functionality via a service is not a new concept as evidenced by the long history of Managed Services and continued adoption of Software as a Service (SaaS). The new (sort of) twist to all of this is that Cloud Computing offers significant, affordable capacity to deliver more than just one application or service at a time, in a relatively short time to value, when combined with frameworks such as DevOps, DataOps and Microservices. Project Management is a complex discipline, mostly because of the need to orchestrate the activities of multiple human beings towards common goals. The statistics show that still, a large number of projects continue to either fail or struggle to deliver results, due to the complexity of aligning activities across team members. A recent article suggests that AI can eventually overcome traditional Project Management challenges by replacing humans with machines which are not subject to the same type of variability. If AI can automate Project Management (Waterfall or Agile) then it can certainly automate activities and tasks related to DevOps, DataOps, SW Development and so on. For all businesses, but particularly smaller ones, delivering their entire portfolio of business functions via a service model is now possible if the underlying technologies and frameworks are architected correctly. We know that this is possible because over the last decade, vendors are delivering more sophisticated business operations via service models. The question isn’t if, but rather when we will be able to leverage service tools and frameworks to scale in a way that companies will not have to think about how they are going to implement the next technology project and who will run it. Rather, companies will be able to dedicate their time to more important things, like moving their business forward without being run over by the constant threat of change. George Orwell’s prediction of the future is here. Now we have to figure out how to deliver it to our customers in the most effective, cost efficient manner.